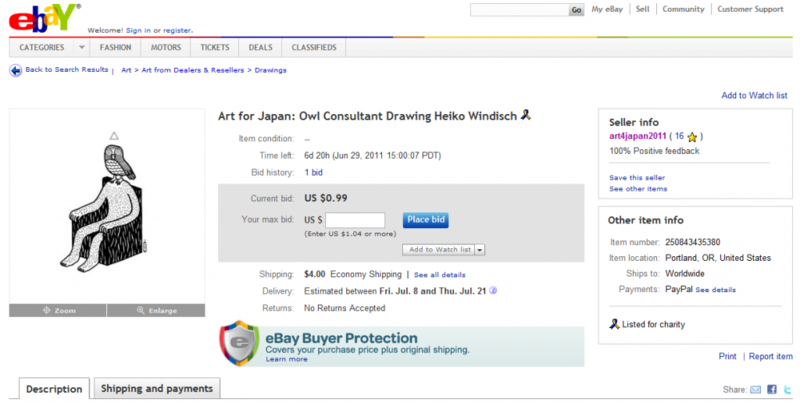 Meg Hunt’s Art4Japan auctions are still ongoing, and this time around I’ve got two originals to throw into the ring: The Owl Consultant and Owl Crest. There are plenty of other originals, prints and zines to discover, too, so place a bid for a good cause, check out Art4Japan. It’s been one week and counting since I’ve been without regular access to a non-shared computer, so bear with me until my new one arrives! German t-shirt community “A better tomorrow” have released my “Pandarama” design as their shirt of the week on their website. You can check it out here. Seit einer Woche bin ich nun ohne eigenen Computer, daher die duenne Nachrichtenlage. Der neue PC (inclusive regulaerer Updates) muesste jeden Tag ankommen. In der Zwischenzeit haben A better tomorrow mein Design “Pandarama” als Shirt der Woche herausgebracht. Lieferung innerhalb Deutschlands ist kostenlos! Zum design geht’s hier.